Tomatoes and tuna salad seem to go together like peas and carrots. This quick and easy recipe is really no recipe at all! Just an assembly of delicious, healthy, and low-fat, low-carb goodness. 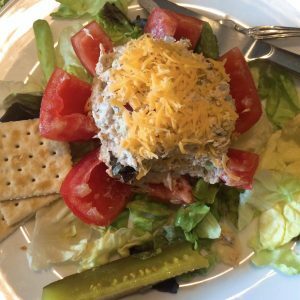 Tuna salad stuffed tomato… okay, it’s not rocket science, but it is a healthy, filling and quick lunch to make if you’re trying to break away from the”sandwich lunch.” It’s filling, low-fat, low-carb, has lots of lypocene and vitamins from the tomato and is pretty much guilt-free. I suppose this dish has been around for a long time, however I first learned of it when I worked at a little dive burger joint in Denton, Texas called The Cozy Oaks Restaurant. The menu consisted of fried zucchini, fried mushrooms, burgers and salads. This was one of our most popular items! Who Knew? At the time, I’m sure the restaurant used the “typical” canned tuna… you know the ones…”bumble’, ‘chicken…’ but after working at Whole Foods Market and learning about sustainable seafood, I must admit I’ve become somewhat of a canned tuna snob. I could go on and on about canned tuna, but let me just say this…there isn’t a big difference in flavor in pole-caught tuna. The difference, to me, is more about disruption of marine-life and its habitat under the ocean. What Does Make a Difference is the tomato. 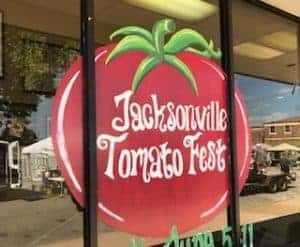 I’ve become a certified tomato-snob after attending last year’s Jacksonville Tomato Festival. I will NEVER buy another store bought tomato unless I KNOW it’s from Jacksonville, Texas, The Tomato Capital of the World. So when you buy your tuna, look at how it’s caught: troll or pole-caught is best for marine habitat. And when you buy your tomatoes, don’t settle for tasteless grocery tomatoes….buy the Real Deal from Jacksonville, Texas. Ask for Kim or Peggy…they’ll get you set up with some great tasting tomatoes for your next Tuna Salad Stuffed Tomato. 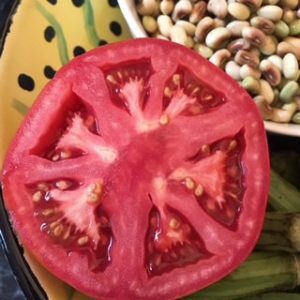 Quarter whole tomato into 16 slices; if you prefer, you can hollow out the seeds, but why? Place tomato on bed of lettuce and enjoy! This is one of those silly recipes that isn't a recipe at all...just an assembly of complimentary foods! This is a great food to take "on the go"; simply prepare it in a chilled "to-go" container; you might want to put a cold freezer block on top, but if it's going to be eaten within 2 hours and is kept in air conditioned area, it should be just fine. If you don't care for tomato seeds, just hollow out the tomato prior to cutting it into quarters.